Discussion in 'iWork Forum' started by xune, Dec 26, 2010. DropDAV is a new service from smiles + laughs that provides a WebDAV front end to Dropbox. What that means is that any iPad or iPhone application that can open or save files through WebDAV can now link straight to Dropbox. Since iWork for iPad has always had WebDAV capabilities built-in, DropDAV provides the long-needed door between iWork and Dropbox. 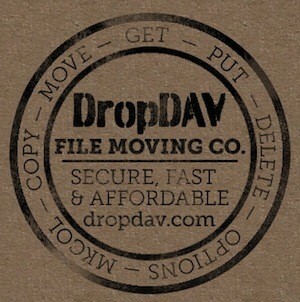 To sign up for DropDAV, you just need to have a Dropbox account. DropDAV provides a 14-day free trial; after that time, the cost of DropDAV is 30% of your Dropbox account price. If you have a 2 GB free account with Dropbox, your DropDAV service will be free. Hit the link below to see how it all works. Here's the fun part: once you have the DropDAV account set up, launch any one of the iWork for iPad apps. While in the My Documents screen, tap the Copy button at the bottom of the page -- it's the one that looks like an arrow pointing to an inbox. Select Copy from WebDAV, and you'll be prompted to enter in a server address, user name, and password for a WebDAV server (see below). In those slots, enter https://dav.dropdav.com, your Dropbox user name, and your Dropbox password, then press the Sign In button.